One of my favorite dishes to prepare when I worked in restaurants was Frutti di Mare. I loved blending seafood together and especially loved serving it over pasta. 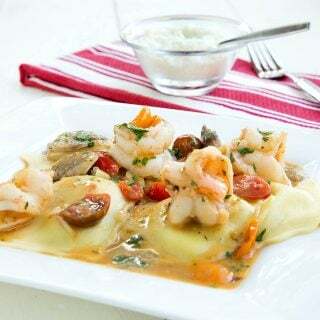 There are as many different recipes as there are cooks for Frutti di Mare, and every family has a favorite ingredient that makes it their own. Depending on what I have available and who I am serving will often dictate what goes into my interpretation of this wonderful dish. My wife enjoys white sauces more than red, so when I prepared this dish for her I kept it in more of an Aioli type sauce. Of course, if you prefer a red sauce or a touch of red feel free to adjust the recipe. This dish also makes a wonderful Fra Diavolo if your mood is for a little more on the spicy side. But tonight I kept it light with just a touch of fresh tomato, more for color than for flavor. I had a nice variety of seafood, but again feel free to add in what you have on hand, fresh fish makes a nice addition, clams and of course lobster. 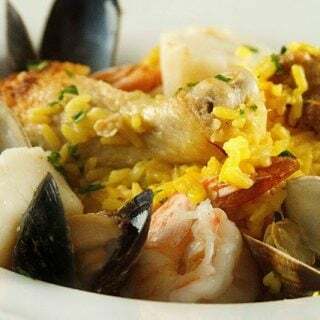 I hope you enjoy my version of Frutti di Mare! Serve your Frutti di Mare over linguine and pour a little of the best olive oil you have on top for added flavor, and I know Italians don’t like cheese with seafood, but I always add some grated Romano cheese to my pasta dishes, even seafood. I do hope you give this dish a try, it’s really very easy to make, and you’ll have a restaurant quality dinner for a less than half the price of dining out at your favorite restaurant. Thanks Dennis. That good ideas for dinner today. So easy to do. I copied the recipe sounds good but one pound of linguine for two people sounds like way too much pasta. This is absolutely gorgeous! I will be craving it all day! there is no flour used in this dish. Thank you so much Maria, I’m very happy to hear you’ve been enjoying my recipes! 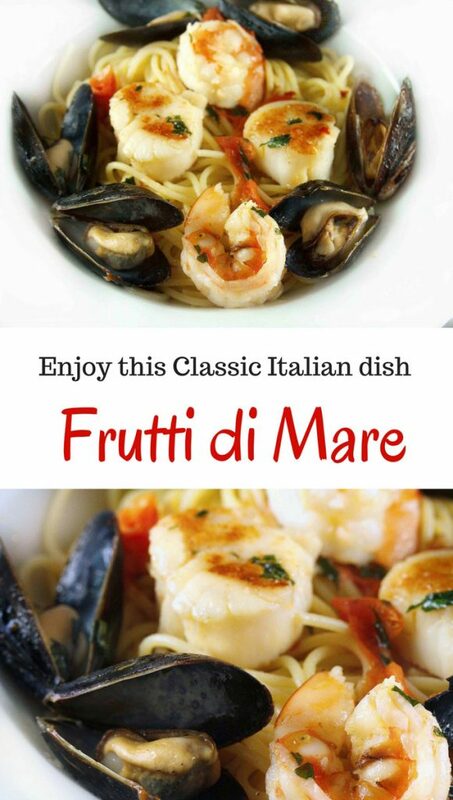 Frutti di Mare pasta is so scrumptious and impressive! My family loves to make it as a New Year’s Eve dinner. We make it much like you did, with white sauce but some fresh tomatoes for that extra pop of color and flavor. Mussels and clams are great in here, too! Thanks for stopping by Valentina, Have a Happy New Year! I love seafood pasta 🙂 it looks so beautiful and yummy! I will keep your secret Dennis! I add chicken stock to seafood dish too hehe. I will add splash of white wine for the hubby. Thanks for sharing your culinary knowledge and story with us Dennis. I like reading about it. Even if it wasn't Lent, I'd be going for this. (Guess I'd have to use vegetable broth or calm juice, though, huh?) Simple and lovely. Thanks for sharing yet another terrific recipe and your secret! So tragic what happened to Monet's family. Your advice is well taken. I so want a big bowl of this right now with a hearty glass of wine. And a warm breeze… yeah, that's my idea of heaven. Definite keeper! I always love ordering/making seafood pasta dishes. Thank you! I am SO looking forward to moving closer to the ocean. AZ is just not known for fresh seafood. 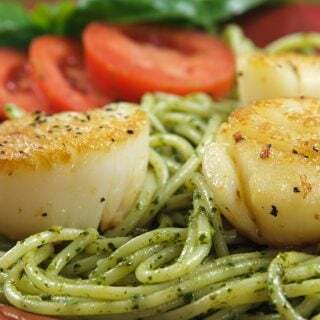 I could just dive into the scallops in your dish. 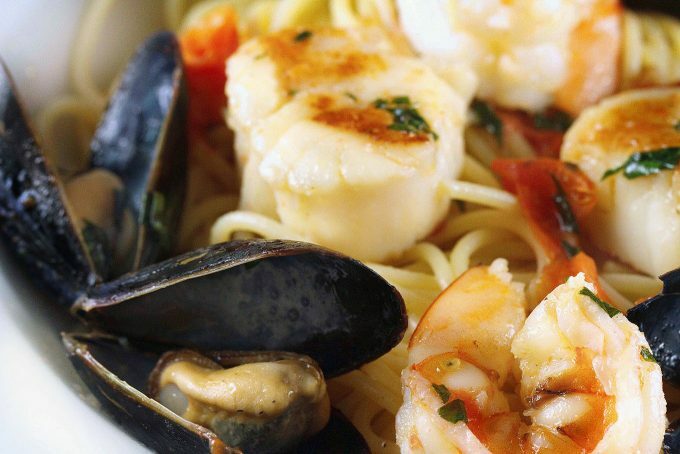 This is my ideal meal–seafood and pasta perfection! Beautiful seared scallops. This has me begging for summer! I love seafood but never get to eat it, since my husband is not a fan. I may have to try this just for myself though. My prayers are with Monet and her family during this difficult time. My heart breaks for Monet's family. They are all in my prayers. Amazing. I would expect nothing less from you. Beautiful seafood dish. 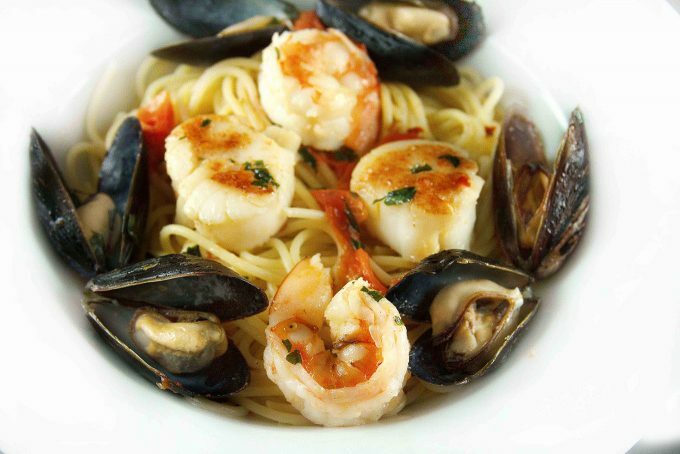 You are right, pasta is almost always a great choice to serve with sauteed seafood dish. I love frutta di mare! Looks so fresh and delicious. Beautiful photos too! This is one of my husband's favorite dishes. I can't wait to try your version! This is a favorite of mine and what I really love here – is that you let the main ingredients – the seafood shine. My mother's cooking instructions always included add "such-and-such" until it looks like this or tastes like that. Getting a printable recipe from here is never going to happen! You just have to go and watch her cook! Delizioso! When I lived in Italy I would go out to the port of Ostia and eat my fill of Frutta di Mare, one of the all-time great light and delicious meals. Your photos are mouthwatering, too! This looks delicious! It's funny that you're from San Antonio; what a small world! I look forward to checking out some of the dishes that you have made and learning from your blog since I just recently started my own. This dish looks divine and your presentation is fab, as well. So sorry to hear the news about Monet's family. I will keep them in my thoughts and prayers. This Frutti de Mare looks delicious. I almost feel as though it needs a splash of lemon juice. But maybe that would be a different dish entirely. It sounds like your wife is a lucky woman to have you "listening" to the food. I love Frutti de Mare and have never made it at home. Thank you for sharing this recipe! I'm keeping your friends in my prayers, I'm so very sorry for their sorrow. I love your simple treatment of beautiful seafood! It's a great example of listening to your food – you don't want to overpower the delicate flavors of your Frutta de Mare. I was horrified to hear about the accident that Monet's sister's family had! Thank you for letting us know. I am praying for them all. Hey Dennis, This looks like the perfect light seafood dish. I can see why it's a favorite. …about Monet, I'm sitting here in tears and will visit her at once. Thanks for the heads-up! I was going to comment about how delicious your meal looks, which it does, but Monet and her family are in my thoughts. 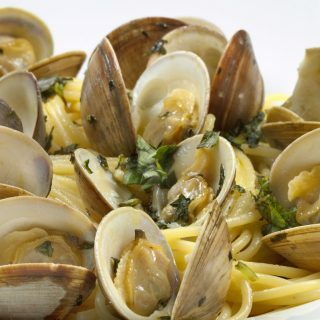 I love seafood/pasta dishes like this. I usually order them at restaurants as Chris is very particular about his seafood. Maybe if I made an aioli type sauce to go over it instead, he'd be more apt to eat it?? Must try that! Monet and her family will be in my thoughts and prayers. First of all, and most importantly, I'm so sorry to hear about Monet's terrible loss. 🙁 I'll send up some prayers. Funny thing, I thought I was the only one who talked to food and got responses. 🙂 This dish looks amazing. I'm adding it to my list! Thanks for sharing!! I love the freshness of this dish, all the gorgeous seafood coming through. I am so upset for Monet, and heading over to her blog right now to offer my condolences. What a terrible tragedy. Thank you for letting us know. Thanks for sharring your wonderful recipe and great photo. Thank you also, for notifying us about Monet, as part of the community we have learned to know and love, our heartfelt thoughts are with you. Oh, you're killing me with your gorgeous seafood dishes! This is exactly what I'd search out on the menu of a fine restaurant….mmmmm. Monet and her family are deep in my thoughts this morning…prayers for them all. This dish reminds me of summer in Montreal, getting a table outside, watching people walk buy, a chilled glass of white wine and this delicious pasta. Thanks for bringing back this memory. This is a great looking dish Dennis! I'm a huge fan of seafood and this just sounds amazing! And my heart definitely aches for Monet, such a sweet girl. I couldn't help but have tears roll down my eyes as I read her post last night. Wishing her all the best and that her family is safe. I love seafood & it has cetainly caught my attention. I'm already drooling. Hahaha! Thks so much for answering my call, Dennis! Looks very appetising and awesome photography. Must try this out sometime soon. Sorry to hear about your friends..will say a small prayer for them. Very true about how fragile life is and how things can really change in the blink of an eye. This so reminds me of summer … and it's been pouring with rain all weekend! So you bring a spark of sunshine in with this dish. I love it … have you ever tried making a risotto with your frutti di mare … that's really good too! Beautiful photos! Thank you so much for sharing this dish. I have very limited experience with seafood. Zero experience with cooking muscles and scallops. Your description of the cooking steps is really easy to follow. I was wondering if you can give me some tips on purchasing muscles and scallops? How do I make sure the muscles and scallops are fresh? Tears, continuous prayers, kind thoughts, and much love to Monet and her entire family at this tragic moment. Praying for GOD'S mercy and compassion surround them all…. Chef, as always a wonderful dish and more sound advice from Mama Jeanette. So sorry to hear of your friends terribly sad news. your seafood is an absolute inspiration. this makes my mouth water, and i just had dinner! must attempt it soon. Stunning dish! Love the look of it and the ease of the recipe. I'd proly do mine with grouper (NOT Nassau) or Mahi. Yummy! Your Frutti de Mare looks amazing. I really need to branch out a little more and try some different types of seafood. I was so very sorry to hear about the terrible tragedy in Monet's family. I will keep them all in my thoughts and prayers. 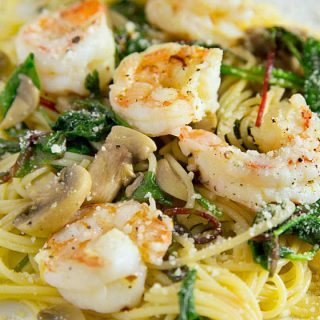 Great seafood pasta dish! Wonerful recipe with a beautiful message. You are so right, love should be given and shown at this very moment, do not leave for tomorrow because "you never know". This dish looks amazing! 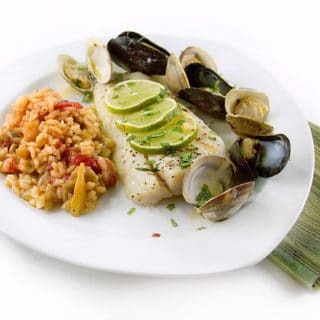 Fresh seafood at it's best, and beautiful with the variety of seafood you have added to it! I like the addition of the fresh basil and cherry tomatoes!